As director of the Office of Scholarships & Financial Aid, Fred Holding juggles responsibilities, budgets and regulations, among other things. But multitasking was a skill he mastered early on. Holding grew up in rural Granville County, NC, and frequently drove a tractor, picked everything from okra to strawberries, and fed horses on his family’s farm. "Farm life – and seeing my mother juggle 30 years of working third shift, helping on the farm, and taking care of kids and her parents through the day – are certainly the source of my strong foundation and drive," he said. "There were times in my adolescent years that I absolutely hated farm life. However, that foundation of hard work is what has kept me humble and is what has prepared me for the demands and challenges of this role. I’m grateful for that experience and wouldn’t trade it for the world." Holding served as assistant director of financial aid at Duke University before joining UNCW in 2013 as the associate director of financial aid. During his tenure as associate director, he managed the office’s customer service unit and made significant improvements to its phone system and communications to families. 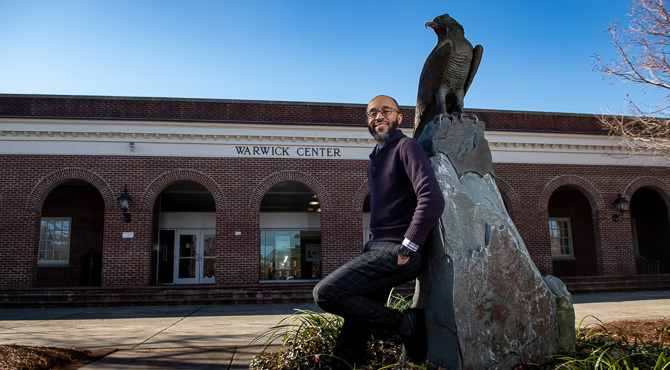 He was named UNCW’s director of financial aid in 2016. The task Holding enjoys the most is helping students access education. Holding and his staff plan to expand their outreach to parents and students, and have started a focus group with student leaders to discuss financial aid at UNCW.